What’s also very early Eighties is the fact that this story reminds me of the Magrathea episodes of The Hitchhiker’s Guide to the Galaxy. 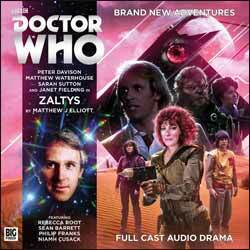 When it is revealed that the people of the garishly coloured and brightly lit (like many an Eighties Doctor Who set, actually) Zaltys used to live underground, the Doctor (Peter Davison) comes close to paraphrasing Zaphod Beeblebrox’s theory that they just didn’t like the surface very much: “I imagine that spending too long out in the open would be rather wearying on the eyes.” Similarly, there are a couple of occasions when Logopolis could easily segue into the same episodes – when the Fourth Doctor speaks grandly (accompanied by some uplifting Paddy Kingsland music) of his home from home called Earth, I always half-expect Adric to opine, “What a dull name”, and when the lad asks if Earth is the planet with all the oceans, I long for him to add, like Marvin, that he can’t stand oceans. Also in keeping with the period are some continuity references regarding one of Adric’s (Matthew Waterhouse) previous adventures and Tegan’s (Janet Fielding) ongoing quest to get to Heathrow. However, what at first appears to be mere light-hearted banter between the two crew members surprised me by proving to be very relevant to the plot. Things are not always what they seem in this audio drama. It helped that those mentions are thrown in amongst several ‘red herring’ references to things like the Zero Room, the planet Thoros Beta, the Silurians, Jo Grant and the Third Doctor. I did experience some initial confusion over the treasure seeker Sable. To my ear, the voice sounded like a man’s that had undergone some kind of vocal treatment, and yet all the other characters refer to Sable as being female. In fact, Sable is played by the transgender actress Rebecca Root. Perhaps this would not have caught me out if I had seen Root in the sitcom Boy Meets Girl. Without wishing to come across as prejudiced, I would suggest that on audio it is essential that a performer should sound like the character the listener is supposed to imagine, be that in terms of gender, race or whatever. On a more positive vocal note, after some initial problems, Matthew Waterhouse has by now recaptured his Season 19 voice – very early Eighties! The writer also foreshadows the future fates of the Doctor’s companions – Adric’s death in Earthshock, Nyssa’s (Sarah Sutton) emerging telepathic abilities in Time-Flight, and Tegan abandoning her quest to return to Earth – without ever being heavy-handed about it. I hope that we will hear from this TARDIS crew again very soon.